Our brand new David Hart Galleries website has officially launched today! We are very excited to present our online gallery focusing exclusively on the “Hart family” which will be run by myself and my wife, Christine. We opened our very first gallery alongside the Pro Hart Gallery in Broken Hill in 1991 where we sold a collection of my brother and sisters artworks, as well as my own. 10 years later, David Hart Galleries opened on the Sunshine Coast in 2001 and was successfully run by my wife and I for over 15 years. Now that we reside in Brisbane, to be close to our adult children, the gallery has become an “online” gallery and we are very proud to showcase exclusively the works of the Hart family. I have been exhibiting along-side my late father, iconic Australian artist Pro Hart, for 30 years and am now so proud that my three adult children (Jake Hart, Chloe Hart and Harry Hart) have now followed in the family footsteps. My brothers (John Hart and Kym Hart) and sisters (Marie Hart and Julie Hart) are also professional artists but interestingly, the art gene started all the way back in the 1920’s with my grandmother, Kath Hart, who was also an artist – making this the 4th generation of Hart artists! Anna Baxter Hart was born in Aberdeen Scotland on the 16th of August 1943. Her biological mother, Elizabeth Helen Isabella Hart had Anna when she was only 19 and gave her up for adoption. In 1943, having a child out of wedlock was considered immoral by society and highly embarrassing for any family. Elizabeth was also working at the time as a house servant, so her income would not have been enough to support a child on her own. Anna lived her early years in an orphanage, she was eventually adopted as a young child by James Finlayson. His wife at the time resented Anna and did not treat her as a step-child, she was alienated by her step-mother who suffered from alcoholism. Anna grew up in a difficult childhood environment with a step-mother who drank heavily and was exceptionally cruel to Anna. Research has shown that Anna’s mother Elizabeth died at age 31 of a blood clot. Anna was twelve when Elizabeth died and never knew her biological mother. James Finlayson eventually divorced his wife and took Anna into another relationship where Catherine his new wife also found it difficult to accept Anna. When Anna was old enough she left home to join the Army in England, this is where she met Edwin Hart. Strangely coincidental, a man with her own surname. Edwin was from a wealthy family in Hazelmere England. He dated Anna for approximately two years until Anna conceived a child Jacquelyn. Anna and Edwin were not married. Edwin was unable to accept this new responsibility, however, he married Anna in a registry office in Scotland, but this was only to give the child a name. This was a swift registry office affair with no attachment to the concept of marriage at all, it was a mere formality. Anna’s second husband David tells the story that on the day Anna and Edwin were married, she was heavily pregnant and Edwin travelled back home to England by train after the wedding. Definitely no sign of romance there. Anna and Edwin did not continue their relationship, however, Anna had Jacquelyn and lived with James and Catherine who assisted her to care for Jacquelyn. They lived in a modest council house in Dundee Scotland. James worked for the boatyard and Catherine worked in the kitchens of a local factory. Anna had done a hairdressing apprenticeship when she left the Army, although there is little information about whether she continued to do hairdressing. She later worked for Timex, in their factory in Dundee. When Jacquelyn was five, Anna met David Kerr. They married in 1968. They went on to have two boys David and John. Anna’s family was complete. For the first time in her life, she felt she had a purpose. She had her own family and adored them. As Jacquelyn grew into a young woman, Edwin’s mother contacted Anna, they exchanged a few letters since Jacquelyn was born and kept in touch. Edwin’s mother always felt that what Edwin had done by abandoning Anna with a child was wrong. When Jacquelyn was 16, she travelled to England to visit Edwin, who was married with his own son. Edwin was besotted with Jacquelyn, he was also riddled with guilt and realising what he had done to Anna, he felt a sense of responsibility to do something good for Jacquelyn. Jacquelyn went to England to live for a short time with Edwin and his family, they were to emigrate to Australia and asked Anna if they could take Jacquelyn for a holiday and to see whether Jacquelyn could find a job. At the time, returning to Dundee had no employment prospects. Anna agreed, she spoke at length to Jacquelyn about the opportunity that awaited in Australia and possible new opportunities. Eventually Jacquelyn felt she should take her mother’s advice and visit Australia. Jacquelyn and Anna kept in touch regularly by telephone however after about 18 months, Jacquelyn started to become very anxious and was missing Anna terribly. They talked often by telephone and eventually, Jacquelyn had decided she would make plans to return to Scotland as the distance was too great, despite the fact Jacquelyn had been able to support herself. But unfortunately, she didn’t make it back before her mother suddenly died. On 28 August 1983, Anna collapsed in the bathroom of her home in Dundee Scotland, she was only 40. She was with her family, her youngest boy John, the first to render assistance to her, he was only 13. Her oldest boy Dave (Jnr) was also a witness to her dreadful fate. Two young boys watched their mother slip into an unconscious state and never recover. Her husband David was completely devastated. Left with two teenage boys and having to give the news to Jacquelyn, who was in Australia, was the hardest telephone call to make. After Anna’s funeral, Jacquelyn returned to Australia, as she could not imagine living her life in Scotland without her Mother’s presence. Jacquelyn was determined to make her mother proud, despite the adversity she faced. Jacquelyn knew that employment prospects in Dundee had not changed and going back there would definitely not be an option. Jacquelyn contacted David through a social media website after he posted one of his paintings that he’d just completed. Jacquelyn said she had been drawn to the painting due to its incredible beauty. Jacquelyn resonated with the innocence of the painting and how beautiful it was, just like her own mother, Anna. The bottom of the painting, if you look very closely is dark, but then as you run your eyes towards the middle you will see it change and come alive, just like Anna’s life, through being abandoned, her life was dark, no-one wanted this child, yet through her adopted parents, she was given a chance to become something. 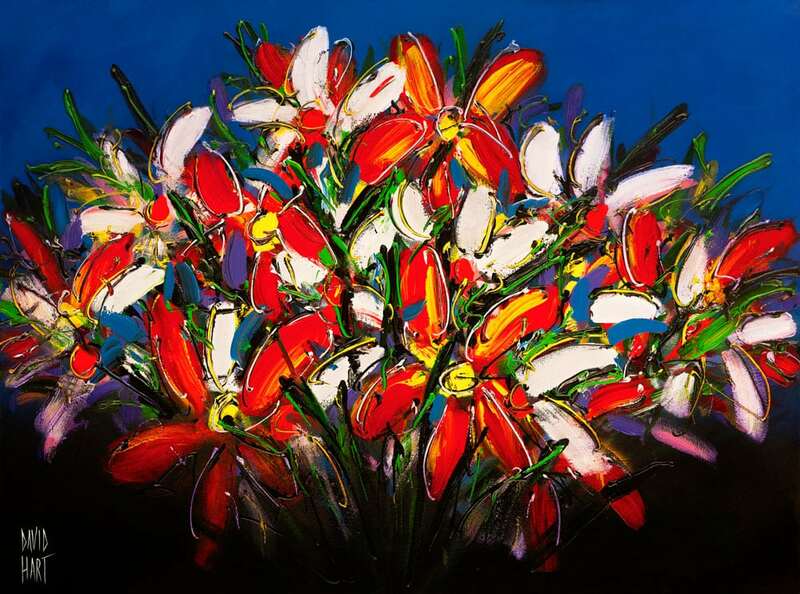 Anna’s Flowers is not just a painting, it represents a beautiful life, the innocence of a child captured by these beautiful flowers, the vibrancy of Anna’s spirit emulated by the amazing colours. David hadn’t yet named the painting and after hearing Anna’s story he decided to name his beautiful piece ‘Anna’s Flowers’. This is a tribute to all children who face adversity, Anna’s story is testament to this fact. She was an abandoned child, yet her spirit was so strong, she faced this and embraced the hard times and turned her life into something, with meaning and purpose. Family was Anna’s greatest achievement. For the first time in her life she felt she belonged to a family, the family she had created with her husband. Her family had given her purpose. Tragically she did not live beyond 40 years on this earth, but she will remain alive in the hearts and minds of those who loved and knew her. ‘Anna’s Flowers’ is a testament to the power of the human spirit, no matter how hard life becomes, never give up. There is always hope, no matter how tough life gets. ‘Anna Baxter Hart’ was a living testament to this fact. Art has been around since the cave-men, but for something that has existed almost as long as humans have, it has evolved at a significantly slower rate. The art world has finally started making use of all of the incredible technology around us, but unfortunately technology and art still aren’t considered synonymous. Modern art, for many, is still veiled with vague and incomprehensible symbolism, this has made it inaccessible for a lot of people. Current trends suggest that most people are moving away from traditional art and are looking for somewhere else to go. A few artists have tapped into this transitional form of modern art, and are making huge leaps in connecting a new generation of people with art. David Hart is one of these artists. He has gone to great lengths to make sure his art is able to be viewed and interacted with on every platform. Social media is just the beginning. Where most artists would only post images of their art, David has taken it a step further and has crossed film and photography with art. He films his entire process and displays it across media platforms. He is a self-taught photographer, videographer, and editor. Everything that is released on his website and social media accounts was made by him. He believes that he needs to be a part of the entire creative process in order to present art that is fully an expression of himself. He plans to delve further into the world of technology and art, incorporating more digital art in his already impressive portfolio. He hopes to engage people with art that that can be enjoyed by everyone. 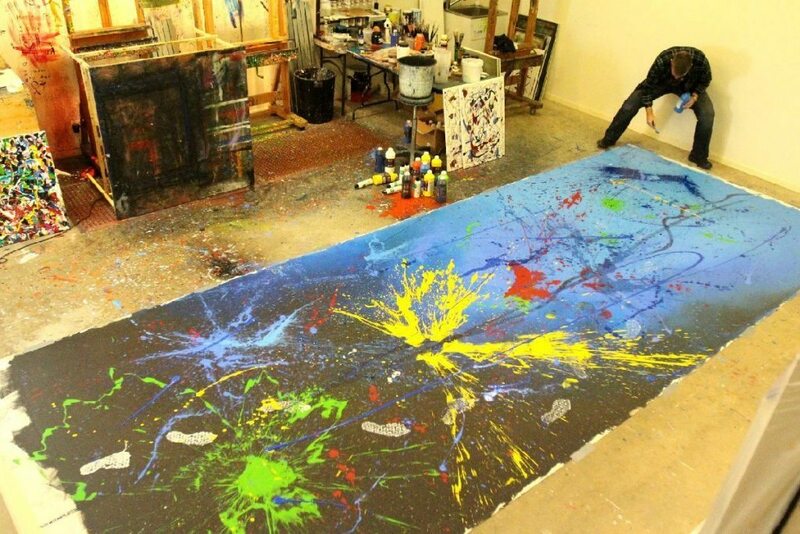 Modern Australian art can seem intimidating for a lot of people, but David does everything he can to help everyone make their own connection with art. If you would like to view some of David’s movies please have a look his YouTube channel and even subscribe so you are notified as soon as he uploads his latest short movie. David Hart has a uniquely Australian story; his experiences and identity are interwoven with the very fabric of this country. From his birth to now, every moment has been heavily influenced by the fundamental culture of Australia. He was born into a family that already held great significance in the Australian art world. Never had there been a man more emblematic of the spirit of this country than David’s late father, Pro Hart. His legacy of art continues to cause waves today, and David has more than followed suit with a reputation as a passionate illustrator of Australian history and poetry. The Story of Waltzing Matilda is perhaps one of Australia’s most well known anthems and one that is very dear to David’s heart. 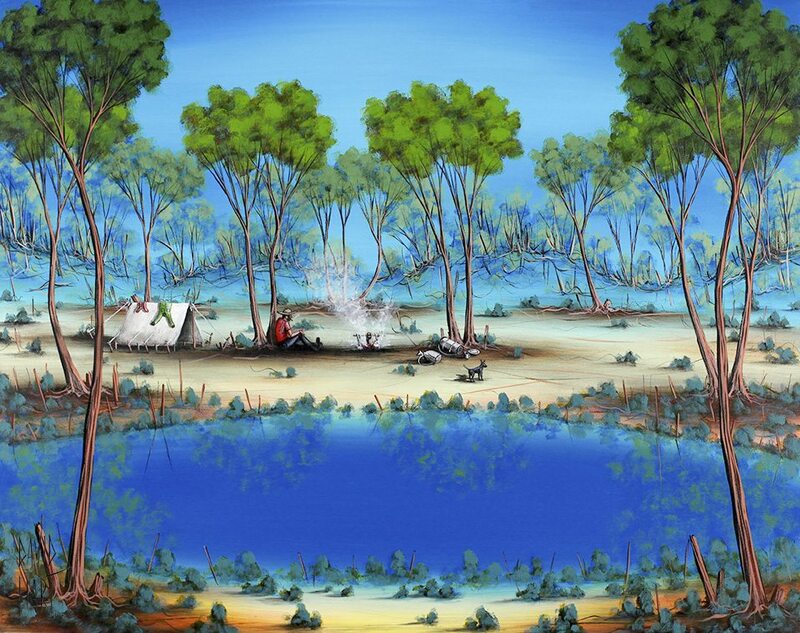 In this series David Hart brings the writings of Banjo Paterson to life, as he illustrates the story of Waltzing Matilda in six stunning scenes. These images have been faithfully reproduced using state of the art Giclée technology and are available as a single print limited addition of just 150 or as a boxed set of six limited to 150 and also as a framed set six limited to 150 editions. David Hart has a uniquely Australian story; his experiences and identity are interwoven with the very fabric of this country. From his birth to now, every moment has been heavily influenced by the fundamental culture of Australia. He was born into a family that already held great significance in the Australian art world. Never had there been a man more emblematic of the spirit of this country than David’s late father, Pro Hart. His legacy of art continues to cause waves today, and David has more than followed suit. David was born and raised in outback Australia. Broken Hill shaped his childhood and eventually his art. Scenes from those days still make appearances in his work. It was a childhood in the outback that made his father’s work so popular, and it was a childhood in the outback that launched David’s work as well. He established himself as a true artist of the bush. His father’s success also allowed him to travel the world and experience the cultures of many other countries. Those experiences reinforced his love for this country and revealed the beauty of his home that he might otherwise not have seen. David moved away from Broken Hill in his 20s, but that only served to bolster his growing popularity. He first moved to Brisbane where he experienced city life for the first time. As with the outback, the city greatly influenced the subject matter of his work. He began including more urban sights and beach scenes in his portfolio. This is when high-end brands began partnering with him in collaborations. His beach scenes quickly became some of his most sought-after pieces, and he eventually found himself living them. 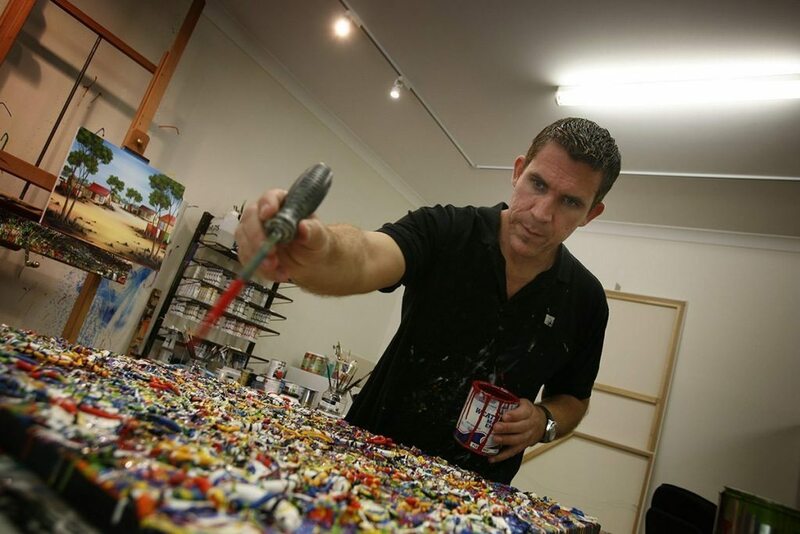 David moved, with his young family, to a coastal home on the Sunshine Coast in 2001 and he opened his own gallery in Mooloolaba, named David Hart Galleries. It was an instant success. David has lived in every type of environment that Australia has to offer – something not many people get to experience. All over the world, David is acknowledged as a truly great Australian artist, his art is recognized as the embodiment of everything this country is known for. 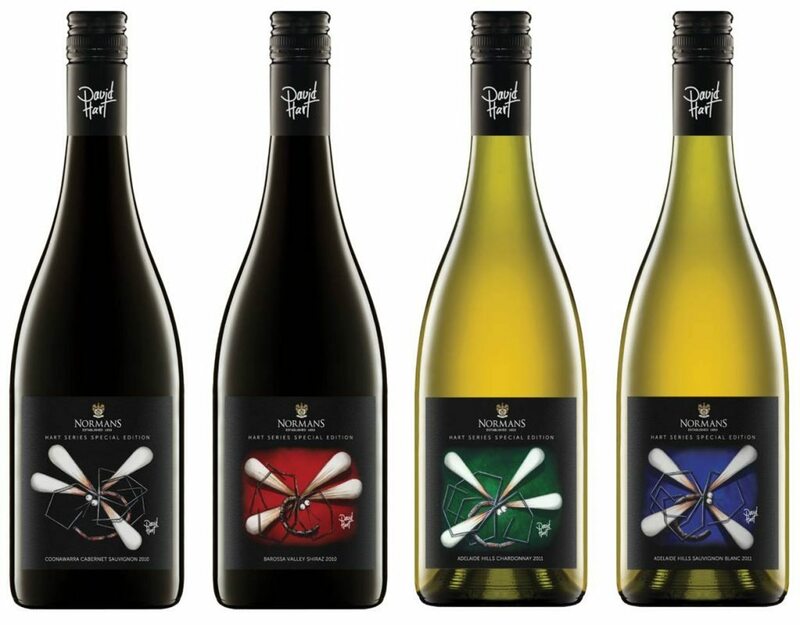 Together with Normans Wines the Special Edition “Hart Series” wine will be sold exclusively through Get Wines Direct. 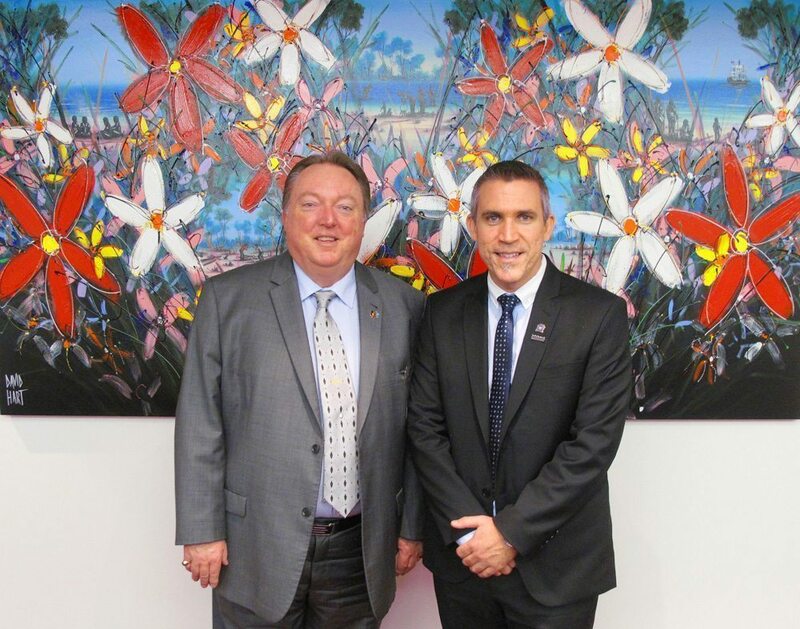 “The Australia Mural” by David Hart was officially accepted at Queensland Parliament. It depicts the arrival of the First Fleet and colonisation of Australia. It recognises the take over and clearing of tribal land for the introduced livestock and the impact it had on the traditional owners of this land, causing hardships and displacement. The flowers represent new life, reconciliation and hope for the future of our nation and its people. David and Christine Hart have recently returned from the very successful Lord Mayor Delegation Mission where they visited five different cities: Taipei & Kaohsiung (Taiwan), Kobe (Japan), Daejeon (Korea), and Hong Kong. 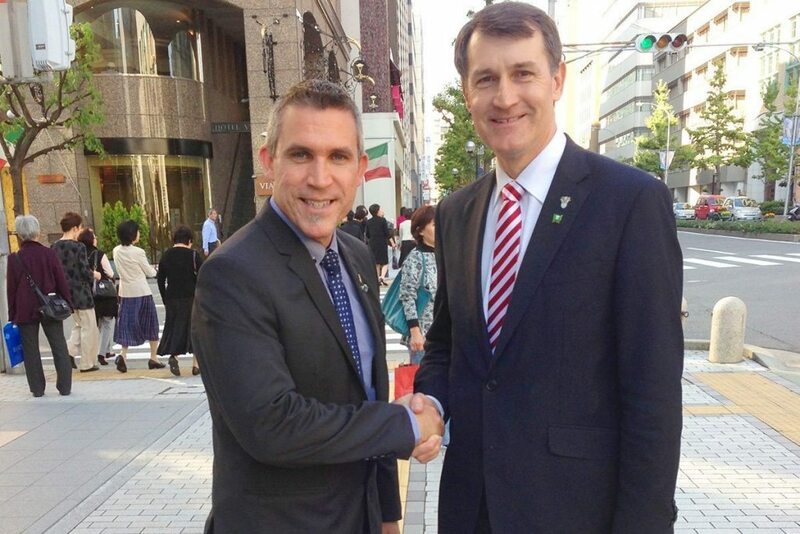 The Lord Mayor worked hard to create business opportunities for Brisbane and the sister cities. Australian Artist David Hart creates a painting for our Olympians as part of the Telstra Hero Message. Part 2. 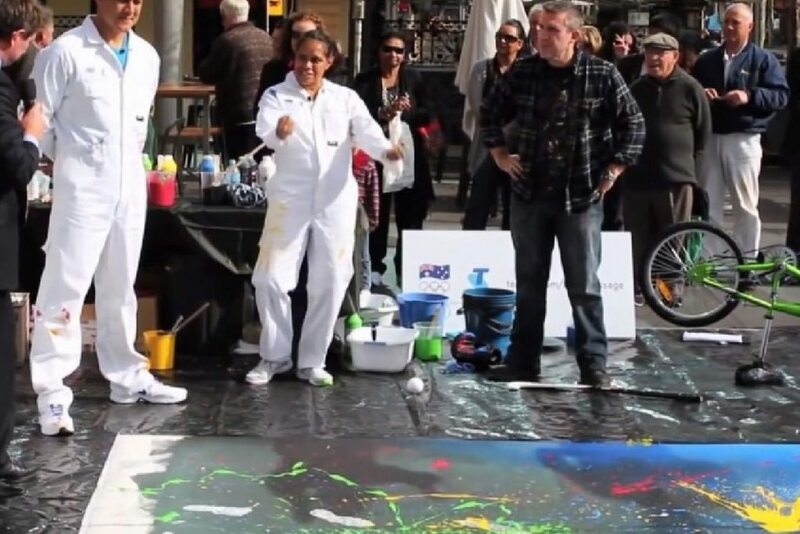 Australian Artist David Hart creates a painting for our Olympians as part of the Telstra Hero Message. Part 1. The trick, says David Hart is tofind an artist in early to mid-career, buy a big piece synonymous with them and keep it for 10 to 15 years. 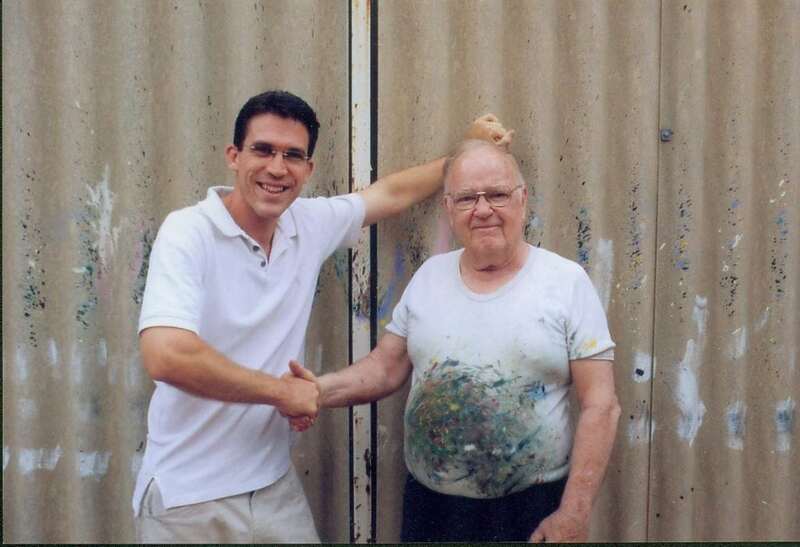 He followed his own advice and bought his father’s paintings, his father being Pro, a man who knew his way around an easel.”Dad would have given me anything I wanbted but I always paid for everything. I’d say to Dad, I’m interested in this. I don’t want any special deals. Whatever you’d sell that to a dealer for, I’ll pay you the same’. 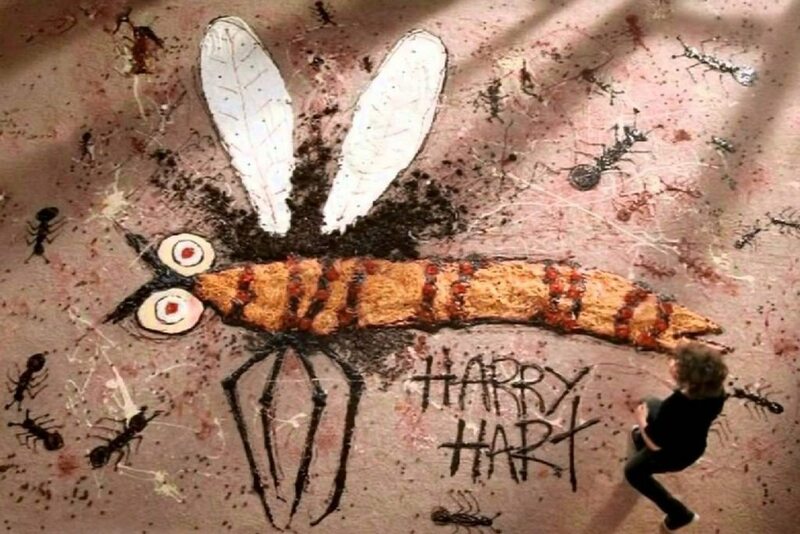 LITTLE Harry Hart, grandson of Aussie art great Pro Hart, lived every boy’s dream when he got to make a mess with stacks of food. Harry Hart (above and below) follows in the footsteps of his dad, David, and his famous grandfather, Pro Hart. SQUIRTING sauce, swimming in spaghetti and jumping on jelly.